Donald Trump on Wednesday swept all five Republican primaries in Northeastern states while his Democratic rival Hillary Clinton also strengthened her lead by scoring victories in four states, bringing them closer to a monumental duel for the White House in November. 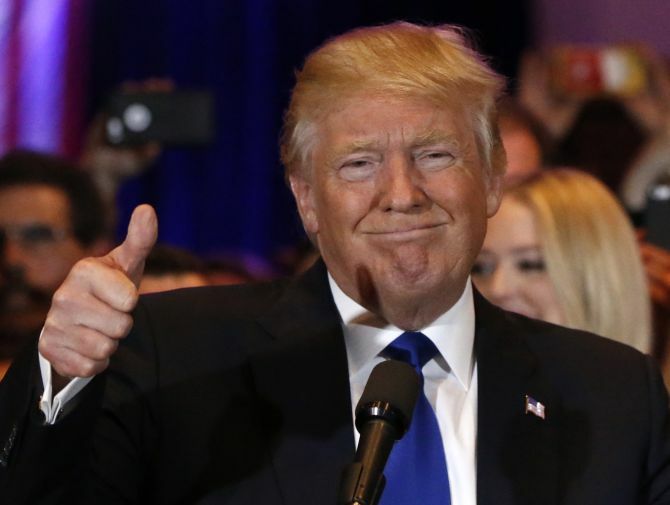 Trump, 69, declared himself the “presumptive” Republican nominee after posting big wins in Maryland, Connecticut, Delaware, Pennsylvania and Rhode Island. In all the five states, Trump bagged more than 50 per cent of the votes. In fact, in Rhode Island and Delaware his vote percentage was more than 60 per cent. In Pennsylvania it was more than 58 per cent, in Connecticut 59 per cent and Maryland 56 per cent. With this, his delegate count jumped to 950. Though the clean sweep gave a big boost to Trump’s White House ambition, he still needs over 300 delegates to reach the magical number of 1,237 delegates required to bag the Republican presidential nomination. “As far as I am concerned, this race is over,” Trump said, adding that his rival John Kasich, who has 153 delegates to his kitty, is simply wasting his time. Kasich came second in four of the five States but could earn just five delegates. After the latest primary results, Trump’s main Republican rival Ted Cruz has 569 delegates and his path to nomination before the July convention is impossible. Cruz came last in four of the five states where primaries were held on Tuesday. Despite notching up more delegates and dominating the media agenda, Trump’s ultimate claim on the nomination remains far from certain. The final winning margins will be crucial in deciding whether he can reach the 1,237 delegates needed before the Republican convention in July. Trump has already criticised the system in Pennsylvania, where the Republican winner is awarded 17 delegates, but 54 other delegates will be unbound and free to vote for any candidate at the convention. On the other hand, Clinton, 68, won in four states -- Maryland, Connecticut, Delaware and Pennsylvania while her rival Bernie Sanders secured victory in Rhode Island. After registering four wins, she appeared to be headed to be the first ever woman to win the presidential nomination of a major political party. 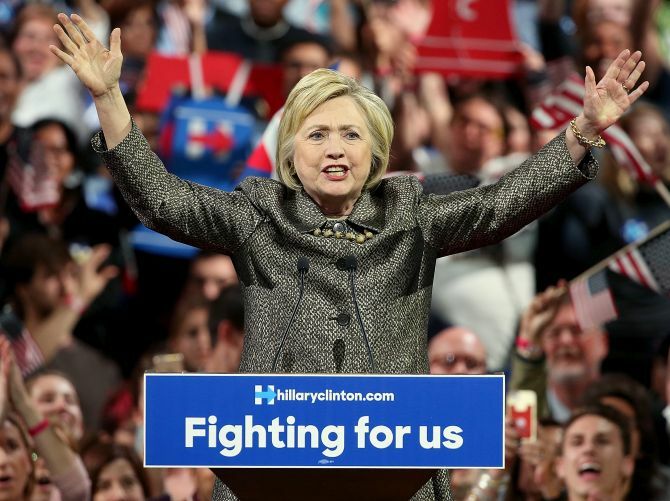 The wins in the states also takes Clinton closer to earning the Democratic presidential nomination. The former Secretary of State now has 2,026 delegates while Sanders holds 1,291. Clinton’s victories build on her resounding success in New York, which stunted Sanders’ momentum and left the Vermont Senator fending off calls from Clinton supporters to fold his campaign so that she can start exclusively targeting Republicans. At her victory speech, Clinton extended an olive branch to Sanders in an apparent effort to begin the process of unifying the Democratic Party behind her candidacy. Clinton foreshadowed the potential general election clash with Trump that could center on women voters. “The other day, Trump accused me, of playing the, quote, woman card,” she said. Trump struck back during his victory speech. “She does not has the strength and stamina” to be the president of the United States and successfully handle countries like China, Japan and Mexico, he said. The next primary is scheduled in Indiana next Tuesday where Cruz and Kasich has entered into a strategic alliance to prevent Trump from getting 1,237 delegates. Kasich is not campaigning In Indiana, while Cruz is not campaigning in the States of New Mexico and Oregon as part of this strategic alliance.